This decoration was established by the French Republic on April 8, 1915 to commemorate individual Mentions in Despatches. The cross is awarded to soldiers, airmen or sailors or all ranks, officers included, and also to officers and men of Allied forces, mentioned in French Despatches, for an individual feat of arms mentioned in a Despatch from the general officer commanding an Army, Army Corps, Division, Brigade or the C.O. of a regiment or the corresponding unit of Naval forces. The different classes of despatches for which a recipient was awarded the cross may be recognized by the following emblems on the ribbon: Army Despatch - small bronze laurel branch (Palme en bronze); Army Corps Despatch - silver gilt star; Divisional Despatch - silver star; Brigade, Regimental or similar Unit Despatch - bronze star. Every mention is represented by its emblem, thus a man can wear the cross with a silver star and a bronze palm. For every five bronze palms he gets instead a silver palm. 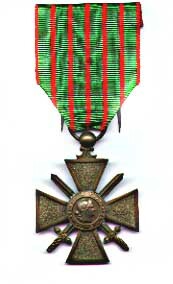 The award of the L�gion d'Honneur carries with it a Croix de Guerre avec Palme. The ribbon is green ribbed with black and has seven red stripes.